If I told you about an anime with a psychiatrist in the form of a giant green teddy bear who gets his kicks by watching a provocatively-dressed nurse jab needles into his patients’ arms, you might expect something along the lines of a comedy. If I went on to describe a few of said patients: A yakuza boss who is petrified of sharp objects, or a man suffering from a permanent erection, you might begin to think of something towards the crude end of the comedy spectrum. While it does have its comedic moments (most notably when Irabu convinces one of his patients to act out one of his outlandish fantasies, by stealing a professor’s toupe,) Welcome to Irabu’s office isn't overtly funny. What it is, though, is experimental, sometimes clever, always very left of centre. Welcome to Irabu’s office (Kuchu Buranko in Japanese) is based on a series of short stories and books by Hideo Okuda, and has also received treatment as a stage play and a live-action film for television. 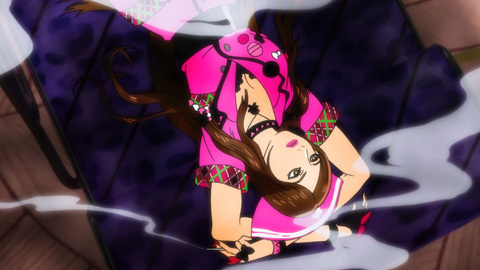 It was produced by Toei animation and published by Siren Visual, and directing credits go to Kenji Nakamura. 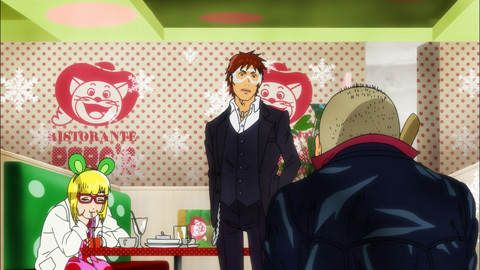 Irabu himself seems possessed of at least three personalities: an overweight man with the head of a teddy bear, an androgynous blonde with glasses, and a young female all pop up, with no explanation or clue as to what is going on. But stack that against characters who, after seeing Irabu frequently turn into Raccoons and Rhinos, and it all seems perfectly normal. After watching the first episode, you’re left wondering exactly what you’ve got yourself in for. The show is cobbled together through a variety of animation techniques, including paper-thin cut-outs and a kind of stop-motion live action photography. It follows something of a formula, as we are introduced to a new patient each show, with a new medical condition. Fan service is provided by Irabu‘s nurse Mayumi, as each protagonist inevitably gets a vitamin injection during the course of the episode. Factual information is provided by the character Fukuichi, who pauses the show to pop up with relevant facts related to the various psychological disorders. Tokyo in Irabu’s office is displayed in bright colours and patterns. Despite this (or maybe because of it), it isn't especially appealing in the visual stakes. The music consists of eccentric techno themes which recur throughout the series, interspersed with some more recognizable tunes. None of it makes sense at first, until you realise that the characters’ stories overlap between episodes. A mob boss wearing ski goggles, and stabbing at his eyes with a pencil, doesn't’t have any contextual relevance the first time you meet him, and it’s only when that character enters Irabu’s office that things become clear. While the subtitles are easy to read most of the time, it becomes very difficult when background and foreground characters are speaking at the same time, and are allocated text at the top and bottom of the screen simultaneously. Have a look at Irabu’s office if you’re desperate for some left-of-field anime, or if you’re a fan of the stories on which it was based. Otherwise, there are better ways to fill your entertainment schedule.